our VHS/DVD/Freeview receiver went wrong, then I had to replace my tablet and now today the overlocker has gone to sewing machine heaven. Franklins in Salisbury did give me some scrap value which was not a lot. But thinking positively the machine was over 20 years old (worked hard virtually every day since purchase) and cost £200 originally so I think I have had my money’s worth out of it. Just typical though that I had sold the 2nd overlocker in February and if I had kept it – it would have saved me forking out over £300 today for a replacement! 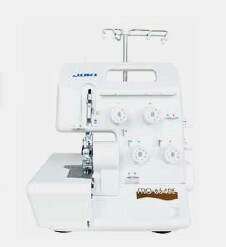 I saw my new JUKI 654DE machine demonstrated and it looks good, does even more things than my previous overlocker and also looks to be much simpler to operate and change from overlocking to rolled hem (a real boon on fine fabrics – scarf-making etc) system. So this afternoon is going to be “Get to know your new machine” and this has to happen really fast as I am so impatient – right in the middle of making a new dress!